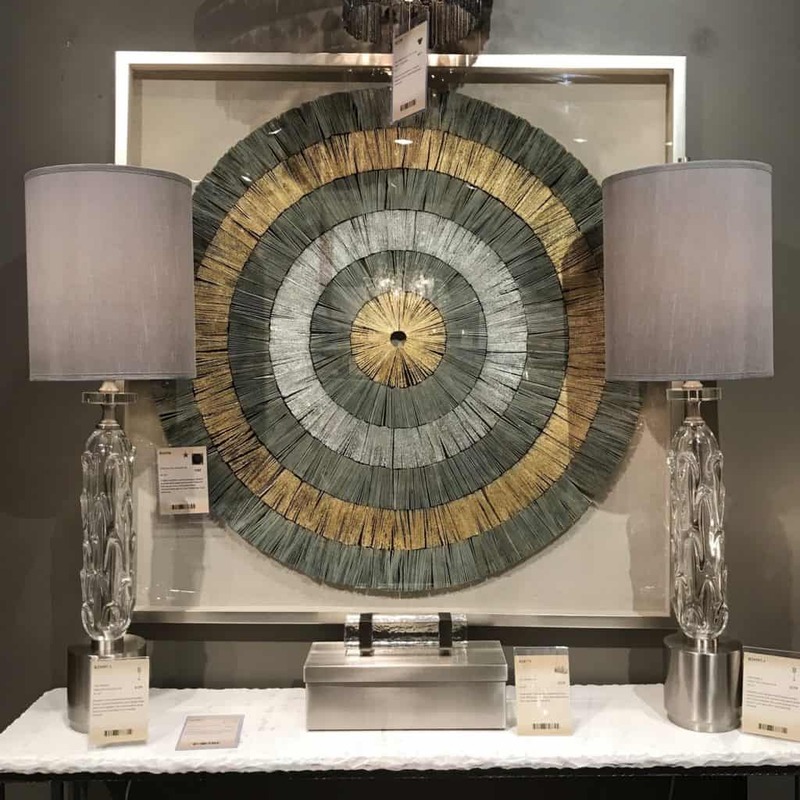 One of my favorite things to do is walk through High Point Market and see what’s currently trending in the interior décor space. As always, a trip to High Point is reminiscent of a child getting lost in a candy store. 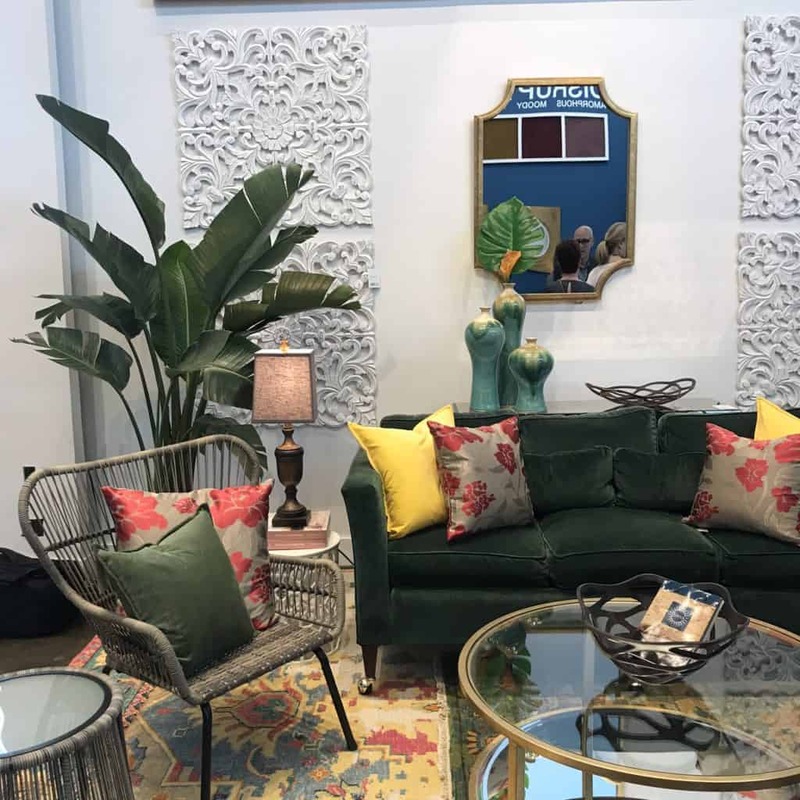 Every showroom has something to offer, and it’s almost overwhelming how many things in interior décor I come across: rugs and textiles, metals, different wood grains, and new shapes and styles. Some features and designs are great, and others are just a passing phase, but I enjoy seeing all of the up and coming looks as well as the new takes on timeless classics. Below are my top three picks of interior décor elements, any of which I can help you make a reality in your home. I have always loved geometry, and it was one of my favorite subjects in school. 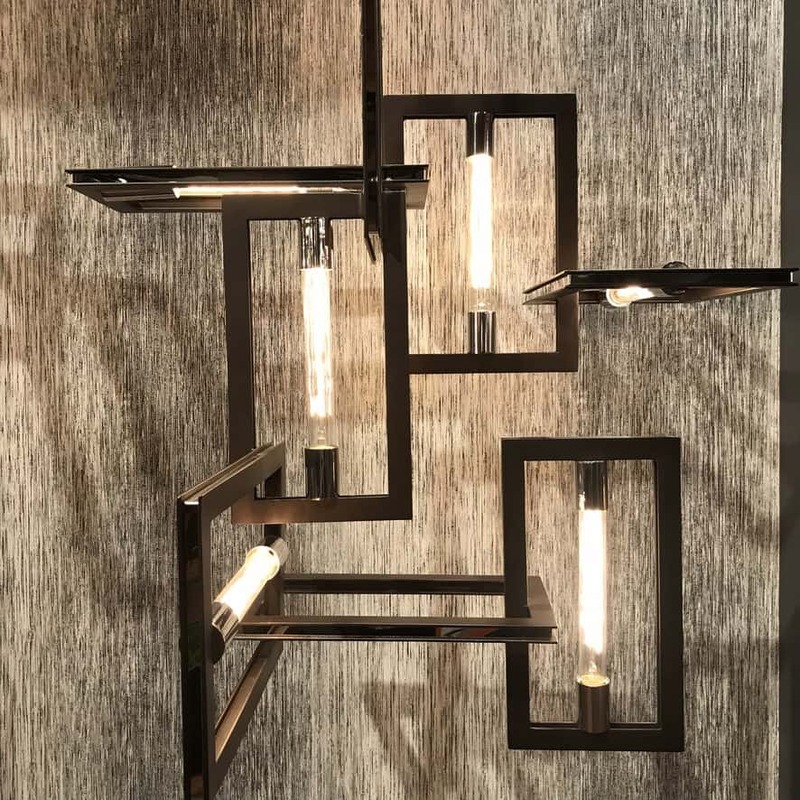 It’s fitting, then, that I should use geometry every day in my projects, and it was a sight for “shape-searching” eyes to see these light fixtures that are taking it to the next level. The clean lines and simple shapes are modern, but also wouldn’t take away from a traditional space. In fact, the chandelier in the last picture is something I would totally use in a traditional dining room. It would add a modern flair, without seeming out of place, as would any of these other geometric designs. This chandelier will look great from any angle. 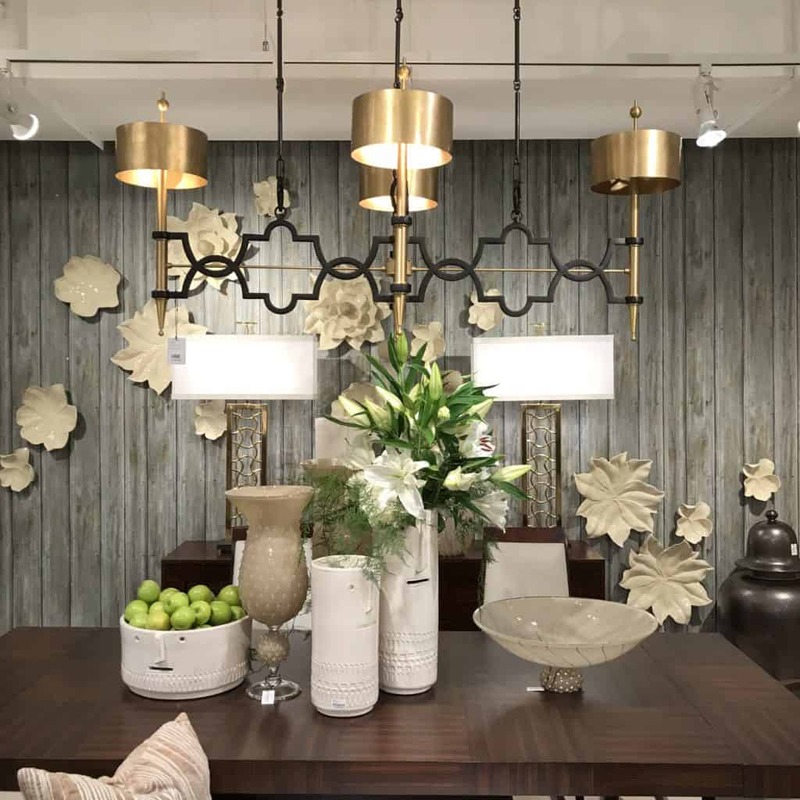 See through shades will visually lighted up seemingly big dining room or over the island chandelier. The shape is not the only thing that make these fixtures stand out. The matte black mixed with brass, the white juxtaposed with mirrored surfaces, the plexiglass against brass – these material combinations enhance the geometry, sharply defining the lines and corners to create truly unique pieces. 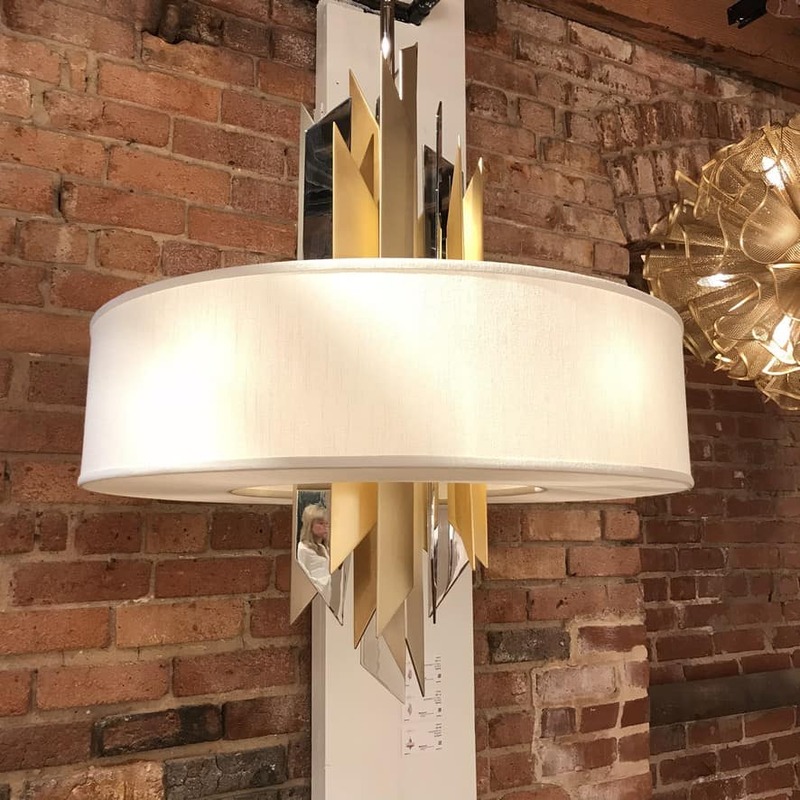 With lighting fixtures like these, you don’t have to put in any extra work to coordinate cabinets, doorknobs, or other metals in your home; the light fixture works to tie everything together, all while adding its own character to a room. 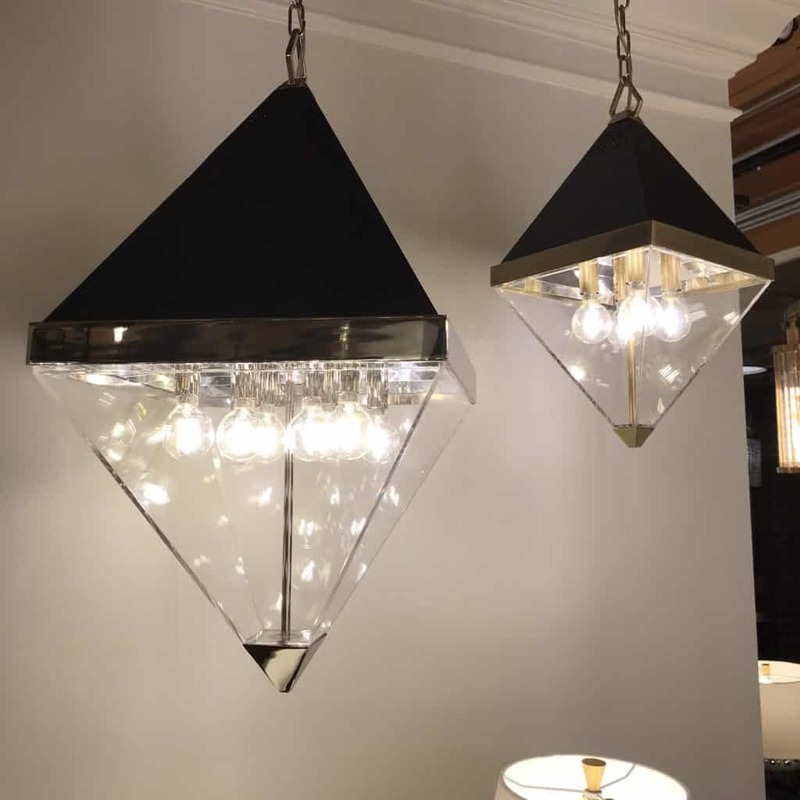 These pendants caught my eye for their shape and mix of materials used. 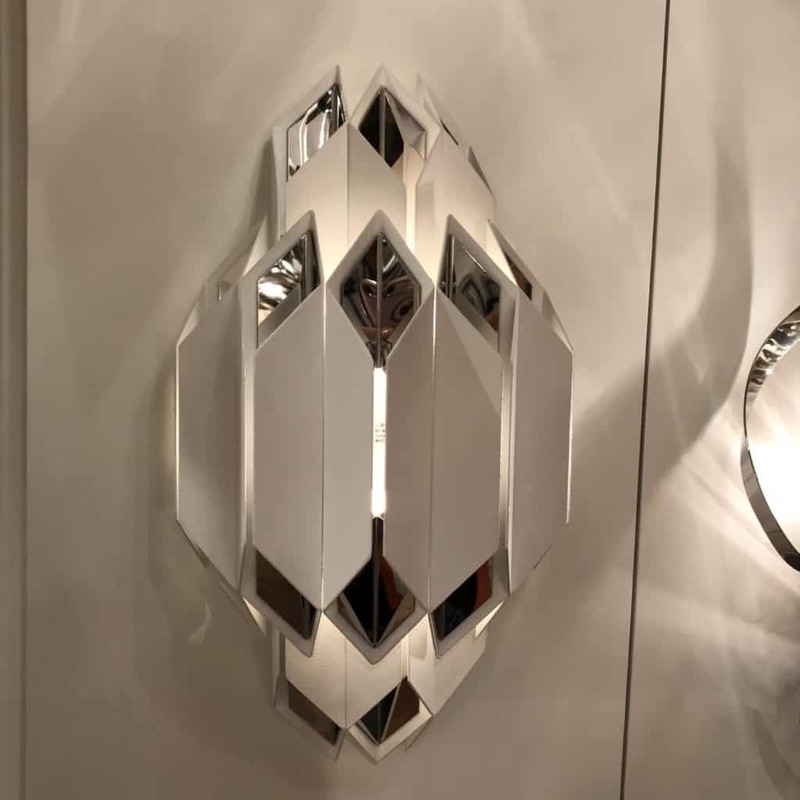 This sconce reminds of bee hive. It will look stunning on a dark background, paint or wallpaper. 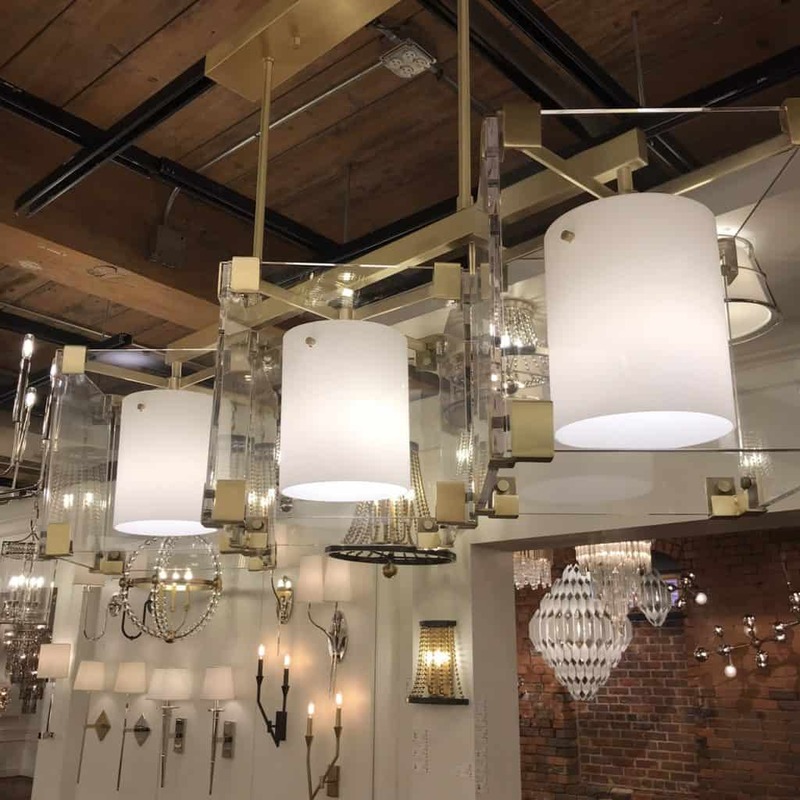 Silk shade plus gold finish plus mirrored finish = stunning modern piece which can be used in a traditional setting as well. 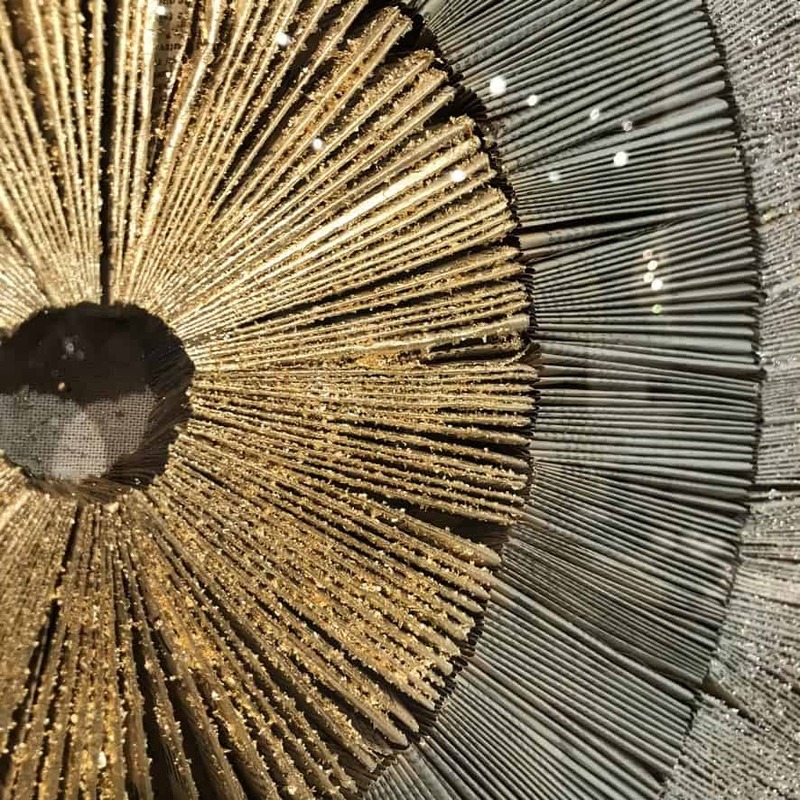 Gold can be overdone to be sure, but when used lightly and frequently, it tends to add to the overall effect of a room and give you the sense of being in a lavish palace (without being overbearing). Adding gold accents everywhere is in vogue and I, for one, am on board. 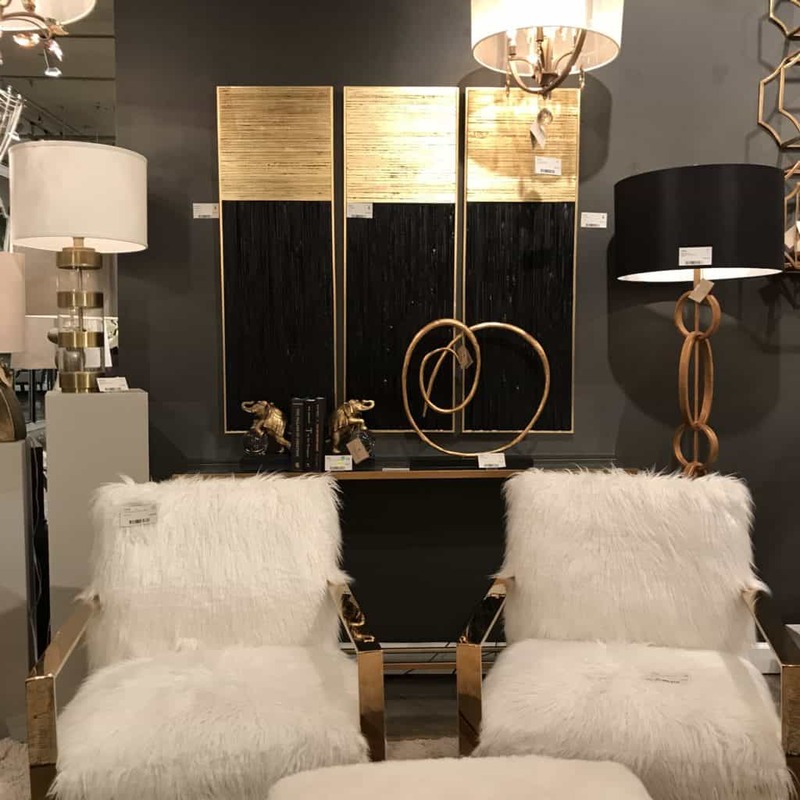 I’m seeing gold accents in everything from actual accent pieces, to lighting and wall décor. We can also approach the use of gold by mixing different finishes with it in décor, which gives a sense of time traveled, even in brand new features. This circular artwork has wonderful texture – ribbons are made of recycled newspaper with some golden paint dust. Brass has a similar effect when mixed with other finishes as well, but gold is warmer and richer. It can also mix with contemporary designs, or be used in a traditional styled space, which makes it very versatile. 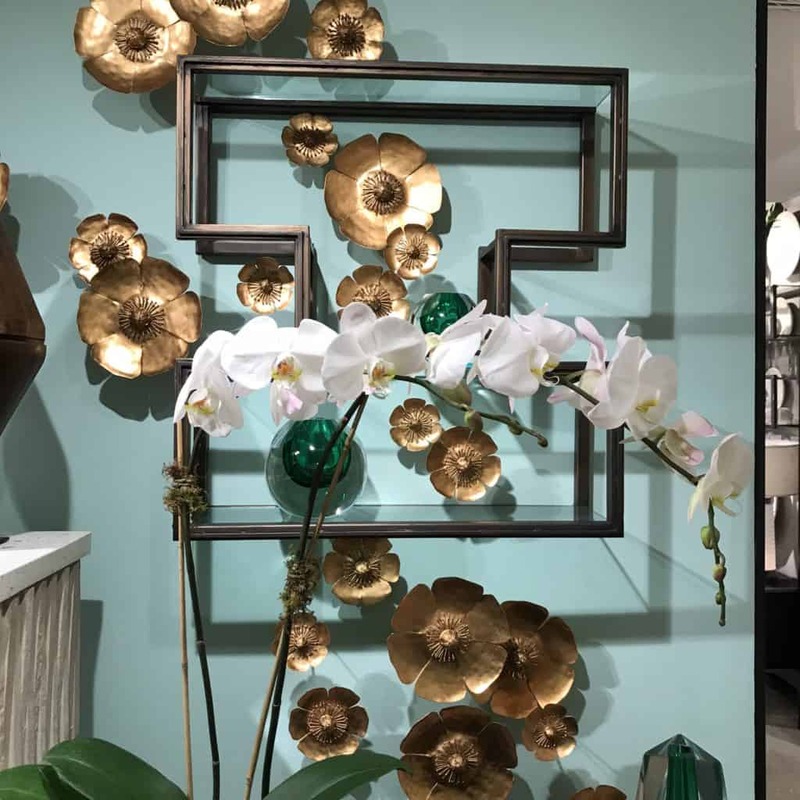 With something that plays so nicely with others, it’s hard to come up with an excuse not to use gold in your home design in some way. It will only add to whatever style you’re going for, and accent the lines, colors, and textures that are already present in your space. Two examples of how gold works with dark finish. Simple lines and interesting shape. Love combination of gold, black and glass. It a small vignette but is shows how gold finish can be incorporated into a modern setting. Velvet gets a bad rep, but when done well it can add richness and depth to any room it’s in. Mixing velvet with bold coloring only enhances that effect, adding rich hues to the room and providing a feeling of bold, stately coziness. I was excited when walking through the showrooms because there was a distinct absence of gray on gray! 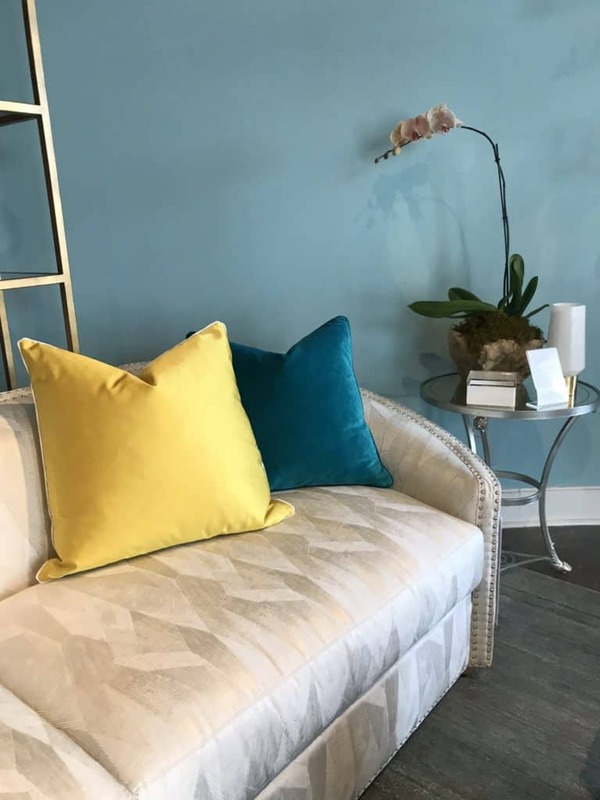 After many years of neutral toned interiors, with shades of the same color stacked on top of one another, we are beginning to see more color come into popular design. Deep cider, spice, moss, classic blue, and bright butter are just a few examples of these beautiful colors that are now cutting through the grays and browns. 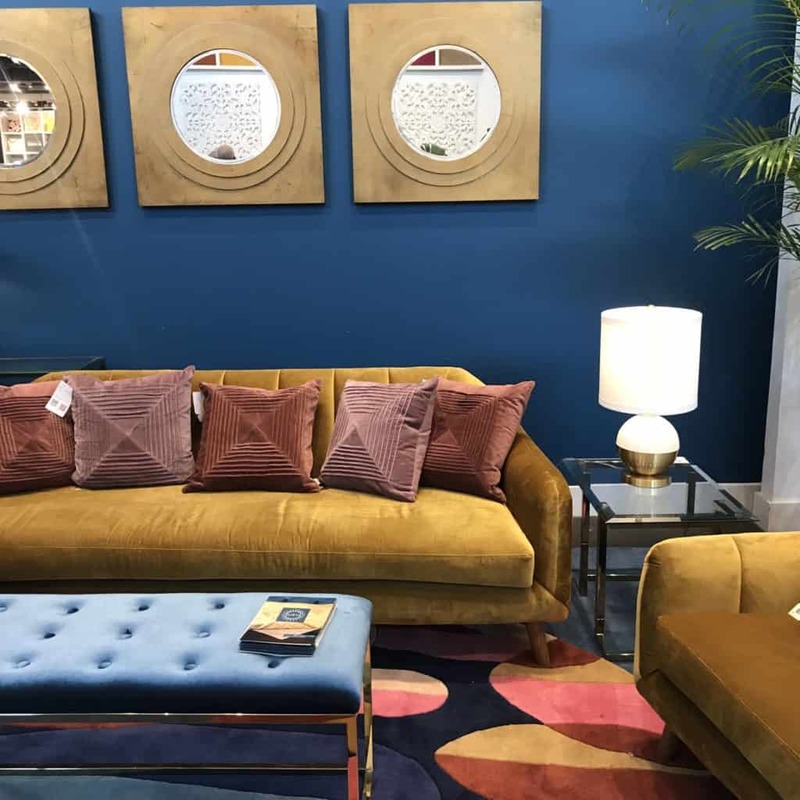 Eye pleasing color combination of blue walls and butterscotch on the velvet sofa. Modern sofa. Soft velvet. It works. I really hope that we will only see more color moving forward. Neutral colors have their place, to be sure, but aren’t we all a little tired of the same old tones? 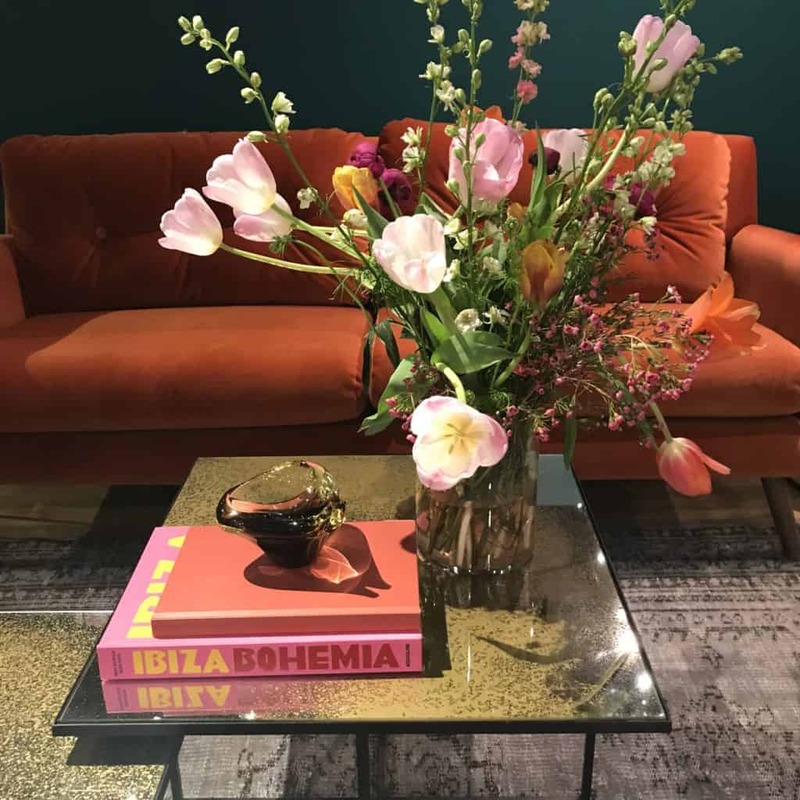 I’m encouraged, because I was seeing these colors in more places than just upholstery – rugs and accessories were sporting the bold tones as well. All of these lavish hues looked even more opulent in velvet, which is soft to the touch and plays both light and shade against each other. I think it was bright yellow pillows that attracted my eye in this one. And moss green velvet sofa. 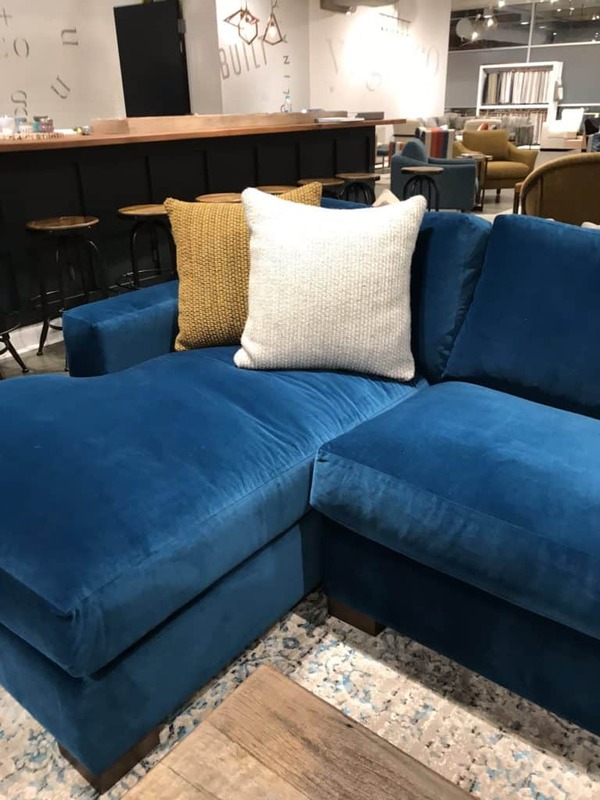 I love this – comfy sofa with chase dressed in velvet. No need to change your neutral upholstered sofa – just play with velvet pillows! Fresh touch of something fun! 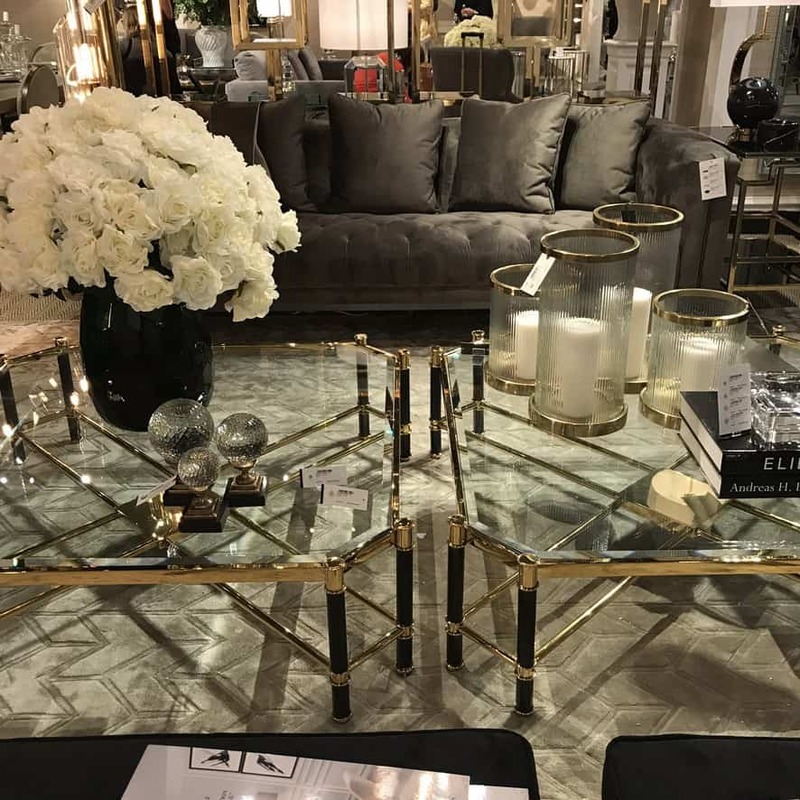 These are only a few of my favorites that I found in my latest excursion to High Point Market. Did the geometry, gold accents, or boldly colored velvet catch your eye the way it did mine? How can your space benefit from these tasteful designs? Contact me today, and together we can bring a few of these beautiful styles into your own home. Leave a comment below or click here for the contact form. ← Best of Durham 2018 Nominations – Voting is open till March 16, 2018. Best of Durham 2018 Nominations – Voting is open till March 16, 2018. Blue and pink – Yes! Girl’s bedroom transformation. Copyright © 2019 LK Design: Home Interior Decorating, Interior Designer. Powered by WordPress. Theme: Spacious by ThemeGrill.